Here’s hoping you didn’t think Virginia’s run to the ACC regular-season and conference tournament championships last season was a fluke. If so, the Cavaliers have already sent a couple of strong messages to put that fallacy to bed. Last Saturday’s comprehensive 74-57 victory on the road at VCU may have capped the most impressive week of any team so far this season. Three days earlier, the Hoos went into College Park and beat old ACC rival Maryland, taking out the No. 21 Terps 76-65. Questions abounded going into this season after the Cavaliers, who were a No. 1 seed in the NCAA Tournament in 2014, lost one of their all-time great players, Joe Harris, as well as last season’s leading rebounder, Akil Mitchell, to graduation. But instead of needing to replace those players, the Cavs’ returning players, some of whom were on postseason All-ACC teams, have stepped up. Malcolm Brodgon, a first-team all-conference guard from last season, continues to be a steadying force, but Justin Anderson has been the biggest revelation for Tony Bennett’s squad. 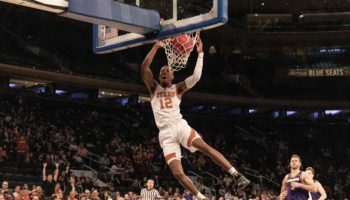 Anderson won last season’s Sixth Man of the Year award in the ACC last season, but so far in 2014-15, the junior swingman has doubled his scoring average, to 15.6 points per game. 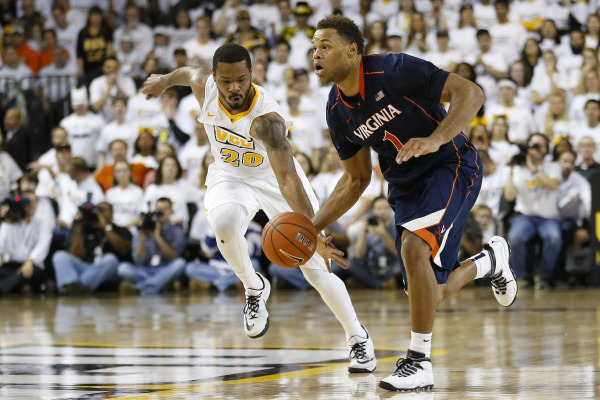 In Richmond, Anderson poured in 21 points to stymie the Rams. Speaking of the VCU game, point guard London Perrantes did an amazing job handling the Rams HAVOC defense, committing only three turnovers while handing out nine assists against relentless pressure. If you were surprised that the Cavs won the ACC last season, you shouldn’t be if they do the same in 2014-15. They’re doing their best so far to give you forewarning this time around. In general, the good-natured temperament of huskies make the breed not real suited for being guard dogs. But the ones on the basketball court in Seattle may be bucking that trend. Washington is off to a 7-0 start to the season, its best start to a season since the 2006-07 season, with the main reason for the hot start being its supremely parsimonious defense. Though the first six games came against vastly inferior opponents, Washington really tightened the screws on Sunday when they defeated No. 13 San Diego State at home on Sunday. The Huskies only scored 49 points themselves but held San Diego State to 36, as the Aztecs only made 11 of their 54 field goal attempts (20.4 percent). The 36 points the Aztecs scored were the lowest points total for SDSU in a game since becoming a Division I program in 1970. What makes Washington’s defense so good? First off, each of their three starting guards, Nigel Williams-Goss, Andrew Andrews and Mike Anderson, are all excellent on-ball defenders and exceedingly quick. But the biggest reason for the new-found defensive prowess is the addition of 7-foot Fresno State transfer Robert Upshaw. In just seven games, Upshaw already has recorded 33 blocks, leading UW to third in the NCAA rankings in blocked shots per game heading into this week (7.4). Upshaw’s numbers, as well as the team’s, could be even better if Upshaw could play more than 17.7 minutes per game, which is his average so far this season. 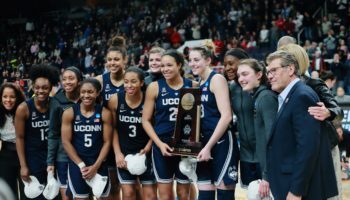 Although head coach Lorenzo Romar has led the Huskies to six NCAA Tournaments and three Sweet Sixteen appearances in his previous 12 seasons in Seattle, the Huskies have not made the tournament since 2011, causing some uncertainty with the direction of the program. 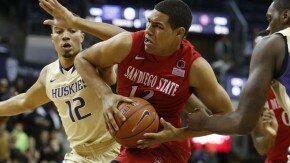 Winning against San Diego State already gives them a high-profile non-conference win, and if the Huskies can come away with another marquee victory in a couple of weeks when they play Oklahoma in Las Vegas, Washington should be in great shape to position themselves to break their NCAA drought, as long as they can at least break even in the tough Pac-12. Washington’s bite on defense so far has been far worse to its opponents than its bark, and it has led to one of the more impressive starts to the season in college basketball. 3. Rise of the Phoenix? Last season, my NCAA Bracketology predictions for Selection Sunday correctly guessed 65 of the 66 teams for the NCAA Tournament. The only team that we missed on was Green Bay, as North Carolina State was selected for the tournament, causing our only blemish. Boo. 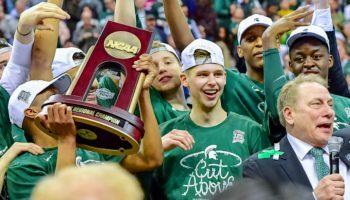 But it looks like the Phoenix have put that disappointment behind them, and last weekend, they took a big step towards building another NCAA Tournament-worthy résumé. Green Bay went into Coral Gables and surprised No. 15 Miami, 68-55, marking the first time in program history that the Phoenix won a road game against a ranked opponent. 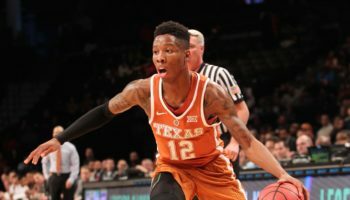 Naismith Award candidate Keifer Sykes, the 5-11 dynamo with a 45-inch vertical jump, had 18 points and seven rebounds, knocking down seven of eight free throws. His backcourt mate, Carrington Love, scored a career-high 20 points as Green Bay led for almost the entire game against the Hurricanes. That win came almost a year to the day of last season’s marquee victory for the Phoenix, a home win vs. eventual ACC champion Virginia. The win over the Cavs, a close loss to eventual Final Four team Wisconsin and a 24-5 regular season with a 14-2 record in Horizon League play put Green Bay in a great position to make its first NCAAs since 1996. A trip to the conference tournament finals might have done the trick in terms of attaining at least an at-large bid, but the Phoenix were shocked by the Horizon’s fifth seed, Milwaukee, in the conference semifinals. 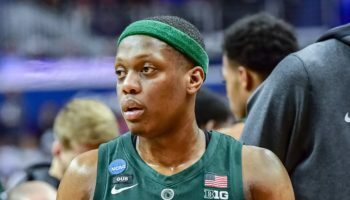 Selection Sunday came and went without Green Bay’s name being called. Sykes and company hope they can finish the job they started last season. And even if it doesn’t end with a Horizon League tournament title, maybe they can do enough beforehand to earn an NCAA bid regardless. If you’re a college basketball fan, here’s hoping that name, Derrick Phelps, rings a bell. The former McDonald’s High School All-America from Christ the King High School in Queens was a member of the 1993 North Carolina Tar Heels team that won the national championship, defeating Michigan in the famous Chris Webber “timeout” game. After a long spell in Europe playing as a professional after college, Phelps found his way back to the States and back to New York City. These days, he’s an assistant coach at Columbia University, a legit challenger to break Harvard’s three-year stranglehold on the league. We caught up with Phelps after a game last weekend, and we talked about him being back in New York, his time in Europe and his influential defensive role in securing Dean Smith’s last championship at North Carolina. Men: Kansas at Georgetown, 7:00 PM ET, Wednesday & Utah vs. Kansas (in Kansas City), 3:15 PM ET, Saturday: Three teams with a lot of potential get to prove how good they really can be this season with some stern tests. First, No. 10 Kansas will play in D.C. to take on a Georgetown team that has already beaten Florida this season and took Wisconsin down to the wire at Battle 4 Atlantis. After that road test, the Jayhawks play at the Sprint Center and take on No. 13 Utah, fresh off of snapping Wichita State’s 35-game regular-season winning streak in Salt Lake City. If you haven’t gotten to see Utah’s Austrian big man Jakob Poeltl play, you’re in for a treat. Outside of free throw shooting, there’s nothing he can’t do well on the court, and he possesses amazing basketball instinct and IQ. Women: Tennessee at Rutgers, 3:00 PM ET, Sunday: The Lady Vols suffered back-to-back losses two weeks ago to Chattanooga and Texas, raising some doubts as to how good Tennessee will be in the SEC this season. (Something tells us they’ll be just fine.) Rutgers, despite losing to North Carolina last Thursday, looked impressive, especially offensively, during the double overtime thriller against the Tar Heels. They followed that game with a statement win on the road at No. 25 Arkansas, 64-52. Keep an eye on Betnijah Laney for the Scarlet Knights, as she has recorded a double-double in every game this season.